Film studios are getting a lot more comfortable with digital and social media as means of marketing their upcoming films. It’s not really by choice. Evidence is showing films that generate digital buzz pre-launch have much better luck at the box office. Sony Pictures, for one, is looking to mobile to make headway with viewers in the lead up to the premiere of this summer’s Karate Kid. The studio has paired up with mobile app advertiser AdColony to get its target audience playing games and sharing info about the film, out in June. “Martial Arts Mastery”! By completing specific tasks, users unlock special awards and can share their progress with friends on Facebook. Yang says that entertainment clients are really embracing technology in the mobile environment, for the same reason that advertisers and publishers are excited about Apple’s new mobile products — engagement. Why is that? Because the majority of audiences attending a film’s theatrical release are younger users — the ones more likely to be engaged and reached through emerging technology. 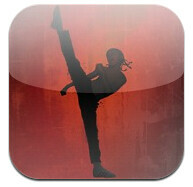 The Karate Kid app is only one week old, and it is already one of the top 30 free downloads this week. Yang says the strategy is to run ads 20 to 30 days ahead of the film release and go with a “full-court press” with ads the week of release. Getting an application that people use on their phones helps achieve permanent product awareness.